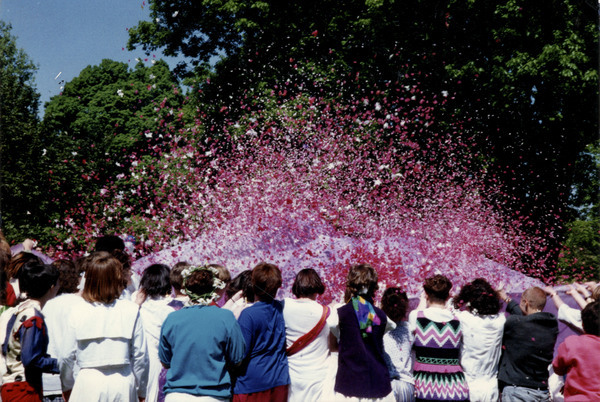 An image of the May Hole from Bryn Mawr's annual May Day tradition, in which the community symbolically breaks the bonds of the patriarchy and rushes inwards a parachute full of flower petals. According to Deb Rowan, class of 1990, it was the first year that they had used the parachute, and the second year that they had used flower petals instead of confetti. Rowan, Deborah, “May Hole,” The Albert M. Greenfield Digital Center for the History of Women's Education, accessed April 26, 2019, http://greenfield.brynmawr.edu/items/show/3175.